Steel Crate Games is bringing Keep Talking and Nobody Explodes, the studio has announced. A release is planned for this summer. 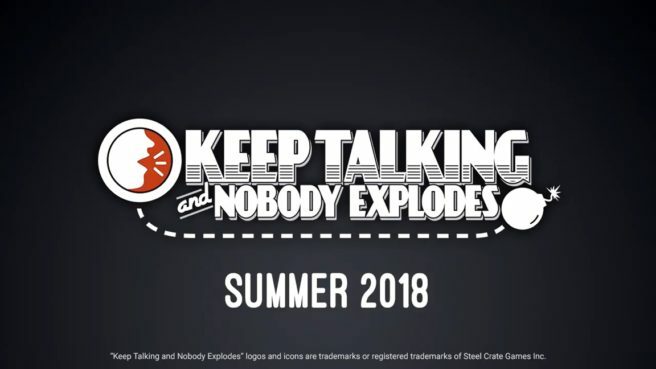 Keep Talking and Nobody Explodes is a multiplayer game. One person is trapped in a room with a ticking time bomb, and receives help from others on how to defuse it. In Keep Talking and Nobody Explodes, one player is trapped in a room with a ticking time bomb they must defuse. The other players are the “Experts” who must give the instructions to defuse the bomb by deciphering the information found in the Bomb Defusal Manual. But there’s a catch: the Experts can’t see the bomb, so everyone will need to talk it out – fast! Rounds are fast-paced, tense, occasionally silly, and almost always loud. Everybody has a role to play whether they are defusing the bomb or deciphering information from the manual. – Challenging puzzles – Test the limits of your communication skills… and friendships? – A different bomb every time – Procedurally generated puzzles keep the action fresh. – Local multiplayer party game – Bomb defusing is a team endeavor. Going solo is not an option! – Only one copy of the game needed – If you can talk to the bomb Defuser, you can be their Expert. Try using your favorite voice chat service and playing remotely.